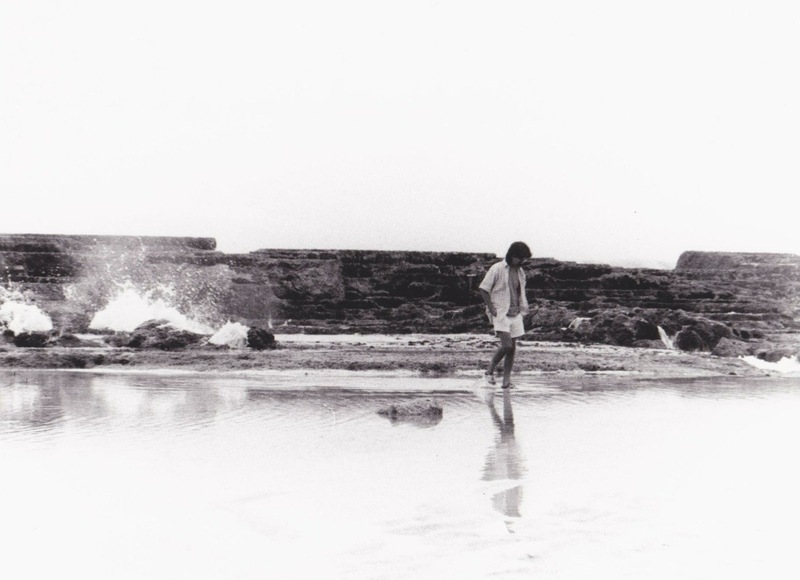 Keith walks along the coral shores of Tongatapu, Tonga, an island nation to the east of Fiji, 1993. The inauspicious anniversary has now come and gone and with its passage, I feel both a deep sadness and a lifting of a veil. No longer do I look back a year and remember what I was doing, how Keith was suffering on that very same day the year before, or the traumas of his treatment. Now when I look back a year ago, I see how much the earth had quaked, my road had shifted beneath me and my children, his family and close friends. No longer would there be any chance of his voice on the other end of the phone, a person to ask advice or crack a joke. No longer would we be able to imagine a time when he could have recovered. It’s September 1st. Can’t believe it’s September 1st. “I think I just saw Dad take his last breath,” she said a year ago. Stassia had looked up at me in the evening dimness of the darkened bedroom crammed with the hospital bed against the kingsized bed Keith and I had shared. Sarah lay groggily waking from her nap not quite taking it all in. I walked up beside the hospital bed as Stassia kneeled from the bigger bed that hugged against it. I felt his neck, then leaned down over his mouth and nose to see if I could hear him breath. Standing straighter I looked at his chest that no longer moved. Then lifting my eyes to his that were gently closed, his mouth still slightly open from his previously labored breathing, I looked back to Stassia and now Sarah. “Yes, I think you did, sweetheart.” We stayed like that for a few minutes, not quite knowing the next move. Then, finally, we each laid our hands on Keith and said a quiet prayer for him, wishing him safe travels on his journey home… that place beyond our reach but where he would be free from the pain of his disease, the humiliations of sickness and crude attempts to stop its crushing march towards death. He was free of it all now. We were sad, but relieved as well. I remember all of this now. Even while I cannot believe that a full year, a full 365 days have passed between now and that moment when he left us behind. I remember sending the kids downstairs to tell their Uncle Gino and Aunt Danette who were busy preparing dinner in the kitchen. I had left them just a few moments before, a little while after sending Stassia upstairs, telling her to wake Sarah, that it was time for her to give dad his meds. I remember feeling a tap on the shoulder even while no one was there next to me, and a sudden urge to follow Stassia up the stairs, entering the room only a minute or two after her. I remember the room was mostly dark except for a couple of nightlights and a yellow cast from the small antique stained glass lamp on the vanity. I remember that after sending the girls downstairs, I picked up my iPad which had been playing music softly while winding through a series of selected family photos I’d put together for Keith to see… in case he had ever opened his eyes those last few days. The music I’d selected was meant to relax him… and us, yet now whenever I hear those songs, I begin to choke up, so many were about the love and caring and commitment to each other that a couple would share. I remember then pulling up the “poem” I’d written the week before, what would eventually become part of his eulogy that Sarah would read at his funeral. In the dimly lit room, I read it aloud to Keith and made some minor adjustments, as if he were directing me from beyond to smooth out a passage here or there. When finished, I laid my hand on his arm and my head on his chest and just lay there breathing… for both of us. It was over. His suffering was over. What lay ahead for me, I knew not what at the time. First one with Keith in a long while. It seems. Keith was on the other end of the call and the conversation was as normal and casual as if he were still alive. K: Good to hear. Now, Jess said she couldn’t translate for you. She’s gonna be busy. 13 Hurdles were coming. M: Yea. I’d heard about that. 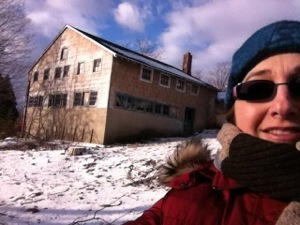 As I answered holding the phone to my ear, I stepped from outside to inside of a house, leaning low to pass under a closed window, trim painted white. 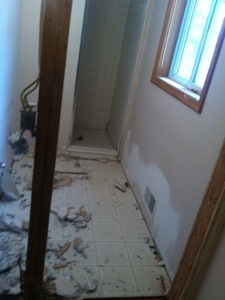 Maybe it was a Dutch door but with the bottom open. My alarm went off and the dream ended along with the conversation. I could still hear Keith’s voice in my head. It was good to hear from him again. Appropriate in many ways, even more so because on Wednesday, July 3rd, I’m taking my new friend back to my childhood stomping grounds. And on July 27, what would have been Keith’s 55th birthday, me and the kids fly back to Fiji to spread some of Keith’s ashes and rejuvenate. Jess is our friend’s wife who own the Beachouse in Fiji where we’ll be staying. PSS: After falling back to sleep, I re-awakened feeling I knew what the 13th hurdles were. I was supposed to take Keith’s ashes to New York, too. It is about “his” going home, not just me. I think he wanted me to bring him back to Ashdown Road, maybe the pond there where I sat with Sarah in my lap and took a photo of the very large Tri-color Heron that walked by me. 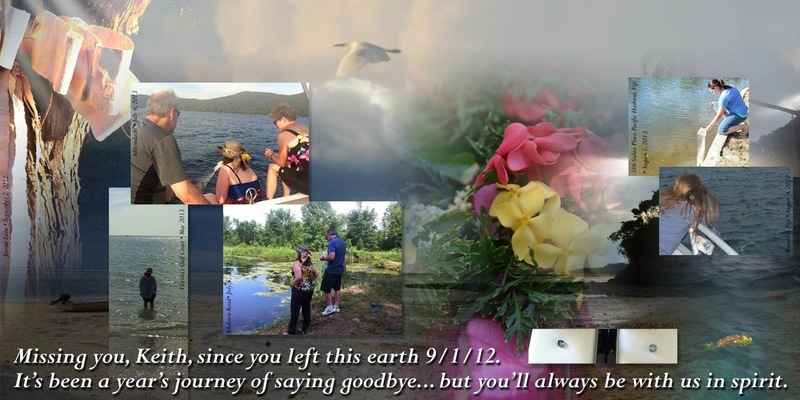 But it could also be that I bring him to a lake in the Adirondacks for his friends to help spread his ashes…. hmmmmm…. which way to go…. Over the July 4th holiday, I went back to upstate New York to visit family and old friends and introduce a new one. We met up with my brother and his family for lunch and then Keith’s best friend Michael was there to take me and my friend on a tour of our childhood memories around the Saratoga region. The first stop, though, was Ashdown Road where I knocked on the door of the first home Keith had ever built for our family. And, after securing permission, Michael and I shared in the act of spreading some of Keith’s ashes on the edges of that same pond Keith had dug, and where the Great Tri-color Heron had visited me when Sarah was born. The next day, as the light of the sinking sun glittered across the quieting lake waters, I handed my iPhone to my friend to record the event. Larry stopped the boat at a special place on Sagandaga Lake where he said Keith had caught a large carp. I then asked Larry and Jean to join me on the boat’s stern and we each took turns dropping the last of the ashes I’d brought into the clear cool waters of this beautiful Adirondack lake. As we dropped the last of them into the water, we each said a prayer for Keith’s peace in the afterlife, the existence you’ve taken on in that other universe that we know you’re watching us from. The ashes swirled into the shape of a large fish and then just as quickly dispersed. 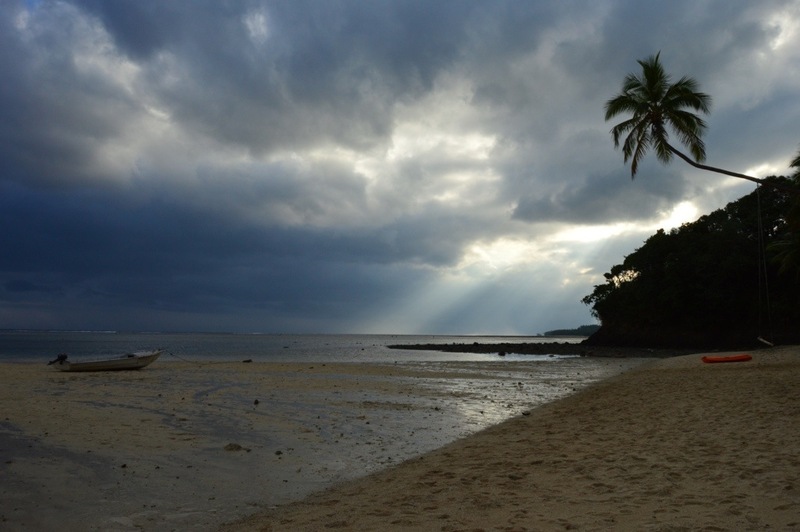 The sun’s rays pour through storm clouds onto the receding tides of Fiji at the Beachouse. August 2013. A few weeks later, on what would have been Keith’s 55th birthday, my daughters, son-in-law and I began the long journey to Fiji. Unfortunately, a weather delay out of Detroit had a domino effect and we missed our flight in LA that would take us to Fiji. With every hotel within shuttle distance of LAX filled due to the other stranded travelers, we ended up camping in the international terminal for 24 hours until the next flight to Fiji would leave at 11:30 pm Sunday. We finally arrived, due to the international dateline, before dawn on Tuesday, 7/30, Sarah and Mark’s 2nd wedding anniversary. It would take us three days to recover from our travels but there are worse things than being stuck on the beautiful beaches of Fiji, surrounded by friendly faces. When on my second voyage out to sea to snorkel about the reef at high tide, I found myself in rapture like a small child laughing at the playfulness of joyous discovery at each colorful fish, sea anemone, or seashell I picked up. It went on like this for what seemed like an hour, even once Sarah and Mark joined us, him on the kayak and Sarah in the water snorkeling along with Stassia and myself. At one point I found myself alone, looking around there was a panoramic view of dozens of different types of colorful fish, from moorish idols to Picasso trigger, from orange and black clownfish to black or blue damsel fish, lemonpeel angelfish skirted in and about the other unnamed colorful players to our dance. Coral heads filled the sandy area with waves of green seaweed, to colorful Christmas tree coral worms as the waves slowly caressed us to the gentle beat of the sea. I was transported back to a similar moment in Fiji during a dive with Keith. 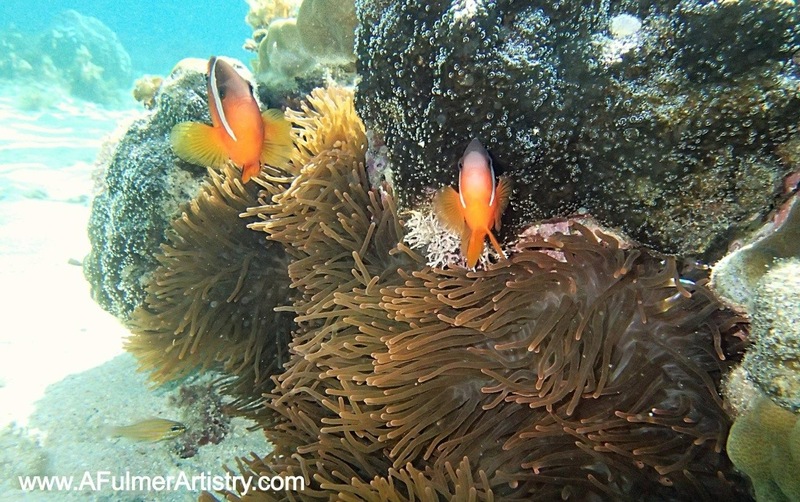 I remember holding onto the top of a coral bommie, schools of colorful fish moved in an harmonic dance all around me, in sync with the waves that pulsed through and around our bodies. As I remembered this absolutely magical time back then, my chest began to tighten. Keith, are you here? I remember now asking myself this. You could swim this type of natural beauty any time you want now, Keith. But is that why we are here? To remember and remind ourselves of that magical time? Is this how we are to honor you here in Fiji? I had to fight back to tears that began to choke me. And just as I could no longer hold them back, I heard sounds of joyful outcry through the water and above the surface. Sarah and Stassia were happily playing in their discovery of some new fish, a group of clowns in an anemone, a big puffer fish under some staghorn coral, a colorful nudibranch that was hiding in the shadows… You taught them that, this joy of discovery of the undersea world, to respect it, yet relish it with a whole heart. I swallowed back the tears that threatened to overtake me. Turning towards the laughing mermaids, our daughters now nearly 24 and 27 years old, I joined them in taking joy of their new discoveries. One of our last days in Fiji, we made our way into the highlands of Viti Levu in order to kayak on the Navua River with a brief stop at one of the many beautiful waterfalls. Our little band of just four travelers and our Fijian guide were mostly alone as we made our way downstream. The occasional motorized longboat passed us heading upriver, sometimes trying to splash us (if it was filled with locals), sometimes throwing a big wake (if filled with tourists), but always with big shouts of “Bula!” Otherwise our trip was beautifully and blissfully quiet as we passed through the deep jungle canyon, marked by the occasional group of cattle clinging to a flatter area to graze. The rush of the occasional rapids would make our hearts beat faster. But then as we passed into calmer waters, the chatter of bird calls could be heard from deep in the jungle, one I mistakenly took for a dog barking until I’d heard it a few more times down river. Possibly an owl, instead. 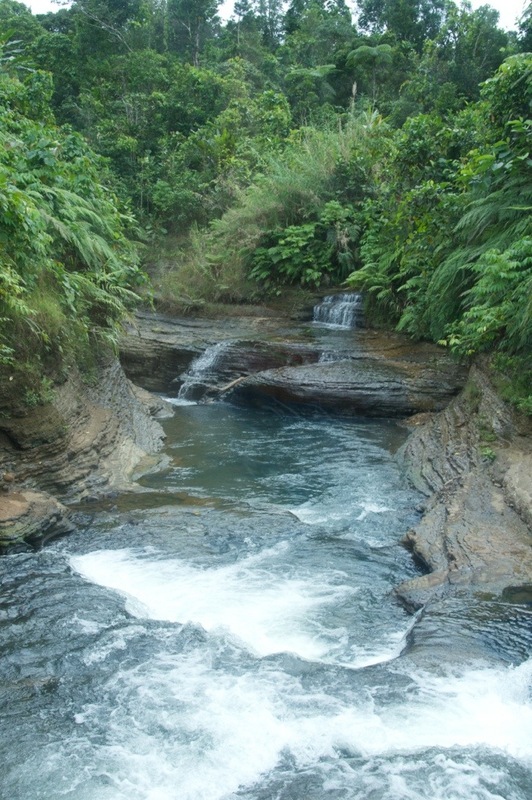 One of the many smaller streams feeding into the upper Navua River. I knew this was a place for contemplation. So it didn’t surprise me, only pleased me more, to see the occasional heron fly by or sit on a rocky perch on the river’s edge. Keith’s animus, I thought, watching us make our way, being sure we did so safely. “Hi Keith” I would think to myself every time I saw one of these beautiful birds. They only seemed to ever showed themselves one at a time. So it was easy to believe that the white heron, then the white-faced blue heron, then the dark blue heron were all Keith… watching over his family and guiding us safely through our voyage. Earlier in our Fiji trip, Andrew, Keith’s best buddy in Fiji, made arrangements for four salusalu to be made. 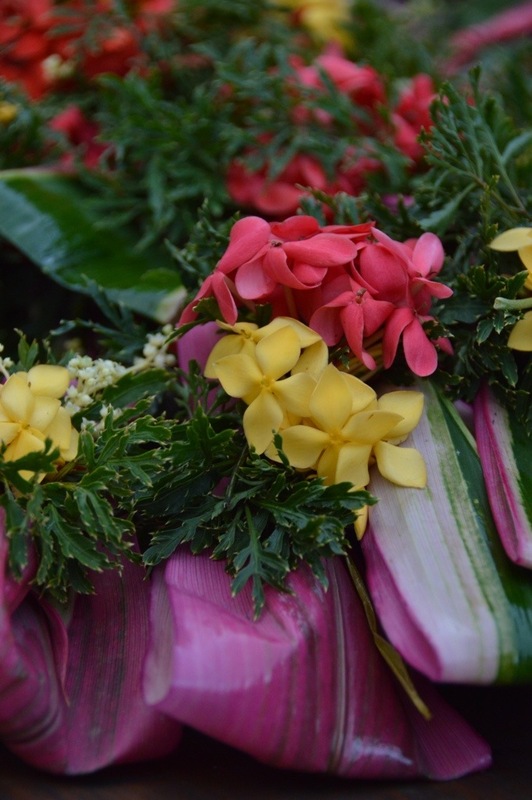 These are Fijian-style flower leis. Traditionally, they would be dropped into the water behind a sailing ship when newly launched. The same practice would be used to send Keith on his journey by putting more of his ashes into the channel when the outgoing tide would take them out to sea at sunset. Sarah, Stassia, Mark and I each poured some of the ashes into the sea followed by a flower salusalu, the sun setting quickly on the horizon as the waves broke loudly on either side of the channel. Andrew held the boat steady and then I asked him to do the final honors for the evening which he did. 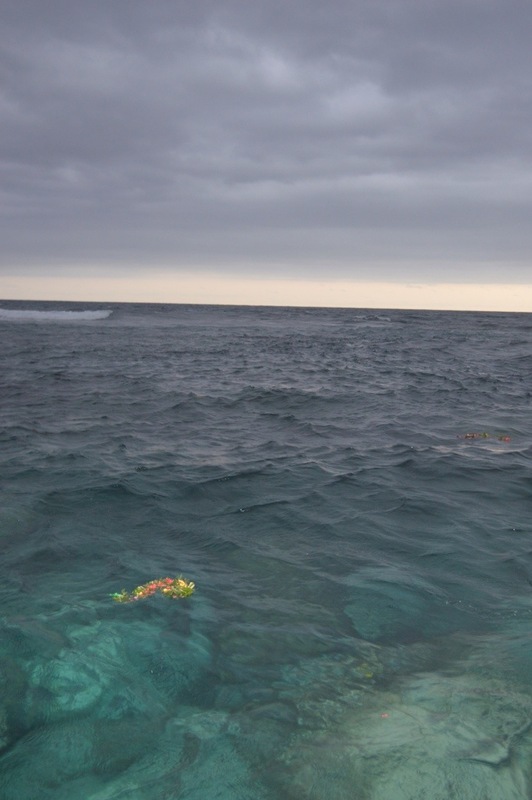 With all my children present during this time as the boat rocked us on the horizon of the South Pacific seas, the flowers drifting out to sea with his ashes in tow, it seemed so much more meaningful than any other time before or since. The next place we took Keith’s ashes was to Sulua Place in Pacific Harbour, where Keith had built our South Pacific home. Once again securing permission after finding out Sarah’s former teacher was house-sitting OUR old house, we went to the edge of the sea wall and, with a few blossoms of bougainvillea, we dropped the rest of the ashes I’d brought to Fiji into the ocean-fed lake. Very early on August 11th, as the plane descended into Detroit, it occurs to me that the act of visiting Fiji again, especially with the kids, and reconnecting with old friends serves a greater purpose. It served to remind me, to reassure me, that my life with Keith – if it were a dream – is one from a shared dreamscape, shared and made real by all those who knew him and remembered his stories. For it makes life – my past life with Keith, and any future we create anew – more than just the dream of songs, those songs that I played on the iPad a year ago, the ones that still bring tears to my eyes now. Just before dropping through the clouds to the airport below, we saw the last of the streaks from the Perseus meteor shower outside our window, a reminder that all things are connected here between heaven and on earth. Over the next two weeks, with the marking of what would have been our 31st wedding anniversary, and then the looming milestones of when hospice would bring his hospital bed, I faced more emotional swings, especially as news reports celebrated the Blue Moon for the summer season. Keith died on the weekend of a Blue Moon, defined last year as the second full moon in a month, but more accurately was the fourth full moon of a three-month season as was the case this year. As the evening wore on and I settled in for bed, I felt my mood change. Sleep eluded me and my back throbbed angrily from my earlier weeding rampage in both the front and back gardens. I lay there in the dark, thinking back to a year before and what we were facing in Keith’s final days, still not knowing how long he had left. Eventually, I just couldn’t stand it and decided to read through my diary entries from last summer. I relived each moment described in those pages yet with the fog of time cushioning the sting of pain. By around 2:30 am, my anxieties began to overwhelm me. I wanted to SEE the blue moon. I needed to see it. But the ambient light in my bedroom was too much. I began unplugging powerstrips that had extra lights. I tried to bend my body over the glass table by the window so I could see the moon that hung very tightly to the roofline of the house at that angle. Last year my bed sat under that window and I could just look straight up from my pillow as the light of the moon pressed sharp shadows of tree branches across the bed. But this year my bed sits on another wall and the window hangs over a glass table with books, photos, incense and a candle I’ve burned occasionally for Keith. Eventually, I climbed across the bed and craned my neck. I needed to try and feel the light of the blue moon, even as I cried myself to sleep. I was on a boat. On this boat, the drawer of my dresser was overfilled and there was a pair of black velvet flats with bows that were getting squished. Music played on the stereo, like my iHome that holds the iPod here. I was getting dressed but would get interrupted by different people. In one case someone who was dressed in a black chefs jacket says to me that I’d better be nicer to someone, that I shouldn’t be so hard on him. I replied that it was guidance and tough love, that he needed it in order to achieve what he wanted. I remember others coming in but can’t recall the conversations. Only that I was in the process of dressing. As I tried to leave the sailboat, the exit was actually a long curved wooden slide, polished smooth and beautifully crafted, like something Keith would have made. I don’t think I went down the slide. I recall then seeing someone, a man who had crazy curly hair. He smiled gently at me. I turned back towards the dressing room to adjust the music. I found that the remote control was missing. All I could do was change the tune by selecting something different on the iPod. But to turn it off, I would need to do something more drastic like pull the plug. I sat the iPod down after selecting a different song, tried to shut the dresser drawer, but the black velvet shoes were getting crushed. The curly-haired man was my friend, the person I needed to be nicer to. The slide was a passage towards the spiritual world… to exit would have meant death for me, an exit from this life. The black velvet shoes are the shreds of mourning and grief that swell the corners of my life, beautiful but sad… They need to be made to fit into the package of my past… not left to overwhelm my current life or my future. The music is the music of life. We cannot turn it off without dying (i.e. pulling the plug). We can only change the song. It was September 1st, 2013… The song that Keith and Sarah danced to at his daughter’s wedding to Mark had just come on the iPod playing on my iHome as I wrote in my diary on this first anniversary. My friend was out in the workshop after having mowed the lawn, trimmed the edges, raked the front yard of its leaves. Sarah, Mark and Stassia would later be coming over in anticipation of dinner, and an evening by the bonfire, toasting their dad. 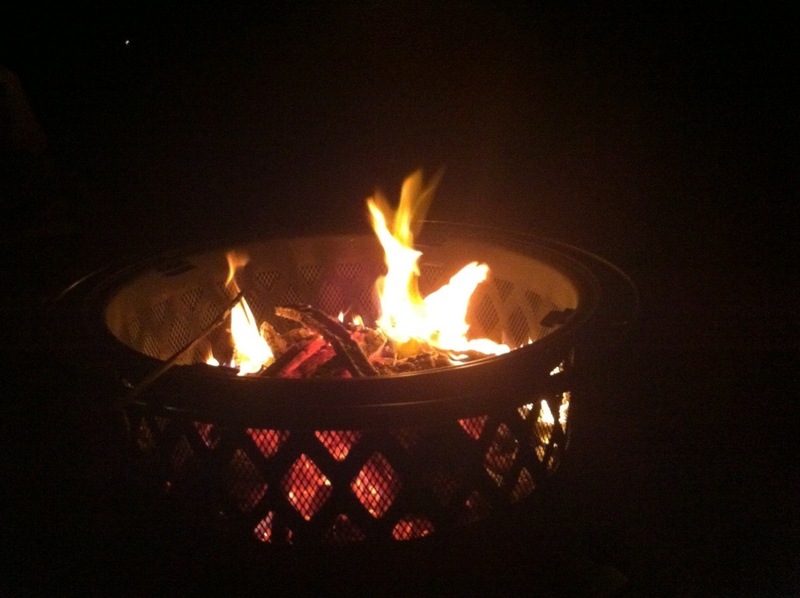 That evening we would burn the masi bow that we’d tied to the front yard tree last year, the day after Keith left us. And we would throw the last of the copal that I’d brought from Mexico, a gift from Tlakaelel back in 2006. My friend was there too, but quietly… out of respect for this family event. It was still so surreal to me… a word I shared with Keith’s sister Barb just the other day, on her birthday – the same as my friend’s. Keith’s father had died in early June, just 9 months after Keith. 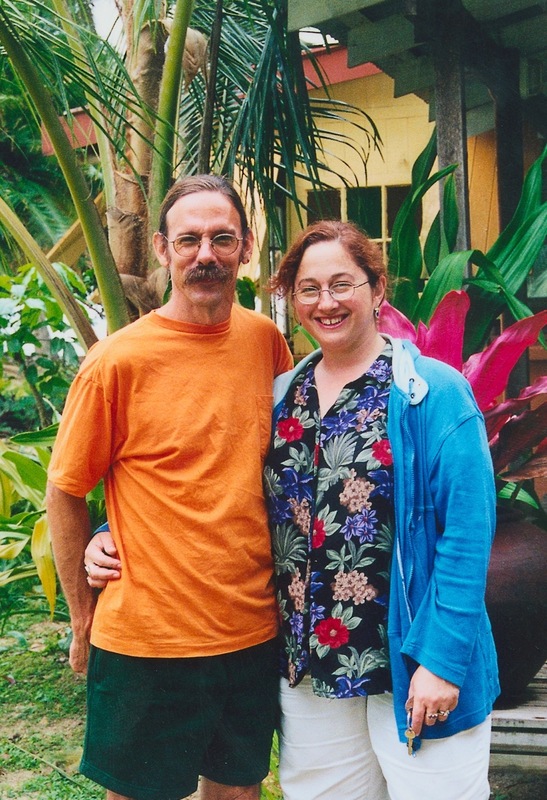 She shared news of the closing on his house in Phoenix, the estate sale while we were still in Fiji, how quickly it had all happened… yet all in the same year as Keith’s death. It felt surreal that I sat here writing in my diary 365 days later, a full year of days, and my friend now sits beside me, ready with a warm and unconditional hug. I’ve needed a lot of those lately. It’s been a surreal experience, this last year or more, beginning with … what… Stassia’s graduation and Keith’s still not getting over his “flu” after too many weeks and months? my flying back from Russia after news of “metastatic liver disease”? the nightmare weeks and months that followed, so few that we never felt we had a chance to even begin to catch up to the disease that had raced through his thin ravaged body. It’s surreal that life went marching on afterwards… surreal that Keith is not here… YOU are not here, Keith. At least not on this side of the spiritual realm. I wish you well, Keith. I know I can feel your spiritual presence… stronger some times than others. I need to keep going on, to empty the drawers of grief, to change the tune on my iPod, and be more open and kinder to the gentle friend who has stepped forward to help me through it all. Only time will tell. Time… heals eventually.